Yes, I remember seeing it and wondering who took it. It seemed to be on a boat and Caroline and a friend were sitting on deck talking. Pierre and friend weren't situated in front of them but behind, but I get your point. Yes, very inappropriate ! The entire family is uncouth, what do you expect? Caroline, Stephanie set the new standard, while Albert has two kids out of wedlock by two different women. It wouldn't surprise me if Pierre was the same and frankly, I wonder if it was Pierre that started the whole mess. 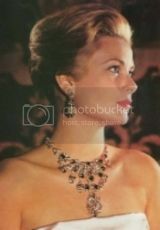 Princess Caroline of Monaco's second husband. Stefano Casiraghi, had no title and neither do his children, including Pierre. Caroline's youngest child is a Princess of Hanover, as she's the daughter of husband number three, Prince Ernst of Hanover! ^^Well, in the article, KF, it sounds like our little friend Pierre here and his buddies were pulling the 'we're so special' routine, to me, and invading this other man's territory or something stupid. Whatever the reason, I guess there's a court of law that Hock served and another for Albert and Co and that, to me, is just not cool. Not cool at all. It won't keep me out of Monaco but it does serve to tarnish the fair-minded mind I really thought he had. Guess not. This is to me, why Monaco is pretty much not too much of a good idea anymore. For business or much else. Pierre is likely to pull the 'I'm so special' routine mainly since no one ever shuts up about Princess Grace; the headline almost sounds outraged that sacred Princess Grace's grandson could ever get into trouble. To do such an act in the presence of one's own mother is what annoys me. I'd love to know what she said when she saw the picture. Princess Stephanie and her daughter Pauline attended the Fight Aids Monaco summer gala at the Sporting de Monte Carlo. The little Casiraghi is very cute. Supposedly Tatiana is pregnant again. Charlene's botox seems to have moved a lot. Pregnancy doesn't suit her face. Some nice piccies her of Princess Charlene. I think she has not been having botox whilst pregnant, it looks that way. I think her face looks tired because she is coming to the end now, and probably not sleeping very well. I still personally think she knocks spots off wasty every time. Give me Princess Charlene any day, wasty never. But she had botox before and it looks like it is moving/not fitting her pregnant face. Kate's face still is more natural than Charlene's. She's had things done but not as much. Though both look older than they are. I think Charlene has more stress; a husband with two kids out of wedlock and a family that is even more out of control than the Windsors. her face looks much fuller maybe weight gain? But she looks happy although tired and I love the coat - she generally dresses very well for her role IMHO - you do not see her making huge mistakes and getting all "wind blown" like some. I would guess while pregnant - no botox? Andrea Casiraghi and Tatiana Santo Domingo have finally introduced their adorable son Sacha to the world, a year and a half after he was born. The couple, who recently announced that they are expecting their second child together, and their 19-month-old son attended Monaco's National Day celebrations at the Palais Princier de Monaco alongside the rest of the royal family, including Prince Albert of Monaco and his pregnant wife Charlene. Sacha is a cutie patootie! Charlene and Albert always look awkward to me. I think there are a few exceptions but for the most part awkward. I always think he looked much happier in those pictures with his ex-girlfriend and the son who looks just like him (would love to see some updated pics BTW. Cute little boy! Looks just like Albert but with brown skin and cute). Then on top of it Charlene always looks sad to me, and the botox and any plastic surgeries have not done her any favors. She looks old and frozen. I do like that she dresses nicely most of the time. I think there are only two outfits she's worn that I haven't liked and I like that she does do something and has her own interests (as far as I know anyway as I don't pay that much attention to this royal family). ^^What an adorable baby boy! Gush. Pierre Casiraghi ce l'ha fatta: dopo 6 anni di passione e rotocalchi ha chiesto ufficialmente la mano a Beatrice Borromeo. Il proposal è arrivato con un diamante rosa. Nozze fissate il 20 aprile 2015. E così la nipote di Marta Marzotto e giornalista al Fatto impalma il terzo figlio di Carolina di Monaco e Stefano Casiraghi. Pierre Casiraghi has done it: after six years of passion and magazines has officially asked the hand to Beatrice Borromeo. The proposal came with a pink diamond. Wedding set April 20, 2015. And so the nephew of Marta Marzotto and journalist Fact impalma the third son of Caroline of Monaco and Stefano Casiraghi. Princess Stephanie and her daughter Camille Gottlieb stepped out at the circus on Friday evening. The Monegasque royal and her youngest daughter were greeted by cheers and applause as they showed their support the principality's annual event on its second day. Prince Albert's sister sported a chic black coat and simple ballet flats while her 16-year-old daughter, whose father is former palace body guard Jean Raymond Gottlieb, wore a monochrome dress with a strapless bodice, which she teamed with heeled ankle boots and a blazer. Now about six months into her pregnancy, Tatiana Santo Domingo decided to enjoy Paris fashion week, sitting pretty at Valentino, Christian Dior and a show by jewellery designer Sabine Ghanem. The boho beauty is expecting her second child with husband Andrea Casiraghi, who is the nephew of Prince Albert of Monaco.